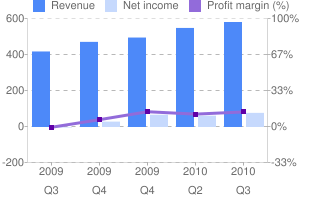 Revenue has been increasing steadily and after a couple of flat quarters, income in Q3-2010 increased almost 19% over the previous quarter. The company has $1 per share in cash which isn't bad for a $7.25 stock. Where things get a little shaky is in the area of debt. The Debt to Equity ratio is relatively high at 64 though it is good news to see that the level debt was noticeably reduced in the last quarter. The company's primary product line is focused on providing power management ICs and discrete components to the PC, automotive, consumer, medical and aerospace industries. Essentially, their chips can integrate with any products that require a power supply. The company's focus on helping reduce power consumption should help adoption of their products. ONNN is also moving into LED lighting, a sector that has been so successful for Cree and where a little competition wouldn't hurt. This kind of diversification might be just what is needed since a dependence on the PC industry could be a near-term problem now that many analysts are claiming that PC sales have slowed. Even Intel has reduced forecasts. In summary, we have in ON Semiconductor a stock that is breaking out but is certainly not over-priced. It is also a stock where management should try to reduce debt while trying to get EPS to increase as rapidly as sales are increasing. Finally, as we approach earnings season, we have a stock that could be susceptible to the headwinds in the PC industry. The bottom line is that the technicals look good, the valuation looks good and all we need is the third leg of the stool: growth in earnings. A good quarter might be all this stock needs to hit new highs.